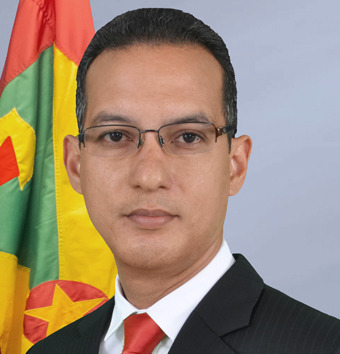 Nikolas Steele is a Grenadian politician and Cabinet Minister. Steele attended Wellesley College where he excelled in academic that earned him the opportunity to completed undergraduate studies at Northwestern University in Chicago where he majored in Business Administration and Finance. Upon his return to Grenada, he became very engaged in developing and managing various business enterprises that earned him the right and legitimacy to be the NNP spoke person on Trade and Industry and Business Development. Nikolas Steele has a wealth of experience, business knowledge, experience, and commitment that he will be a very effective and productive as the electoral representative for the Town of St. George. He deserves full support and voters in the Town of St. George are urged to give him their unqualified support. Nikolas is no stranger to the Town of St. George. Prior to his nomination as the NNP candidate, he had established himself in the constituency as a caring person for the socially disadvantaged especially the youth of the constituency. His ongoing support and efforts to improve sporting facilities, environmental surroundings, and skills development is clearly an attestation to his civic commitment and responsibilities. Following the NNP's election victory In February 2013, Steele was appointed Minister of Foreign Affairs in the Keith Mitchell Administration. In November 2014, Steele was appointed Minister of Health and Social Security. In the 1 July 2016 Cabinet reshuffle, Steele was appointed Minister of Health, Social Security, and International Business. Steele is contesting the St. George South seat for the New National Party (NNP) in the 2018 General Election.